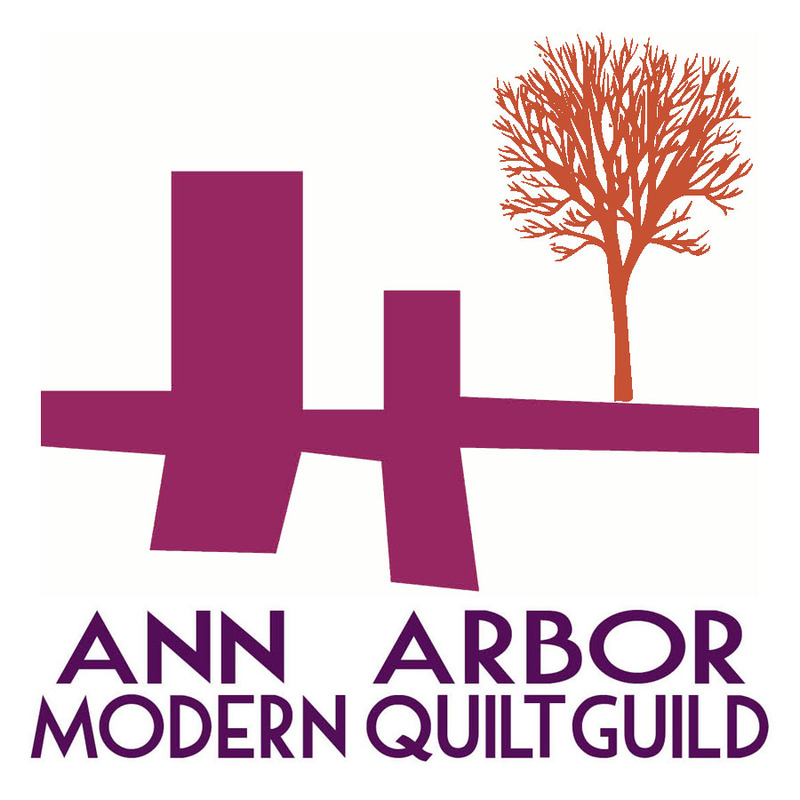 Well, it's the last day for QuiltCon submissions, and I hope you all have submitted some yourselves! I'll show you the ones I've submitted over the next few weeks, I put in 6! Not that they are all great, but because I had four fairly strong ones, and two I thought, well, why not? After all, because you submit in batches of 3, it doesn't cost any more to submit 6, once you've decided to go for 4. Last week, I showed Fugitive Flower, my 300+ color quilt. Today let me show you, uh, "Complicated Drunkard's Dots" Frankly, not actually a fan of that title. I've given it many, but none seem that great. This is a long shot to get in the show, I think. But I like it! 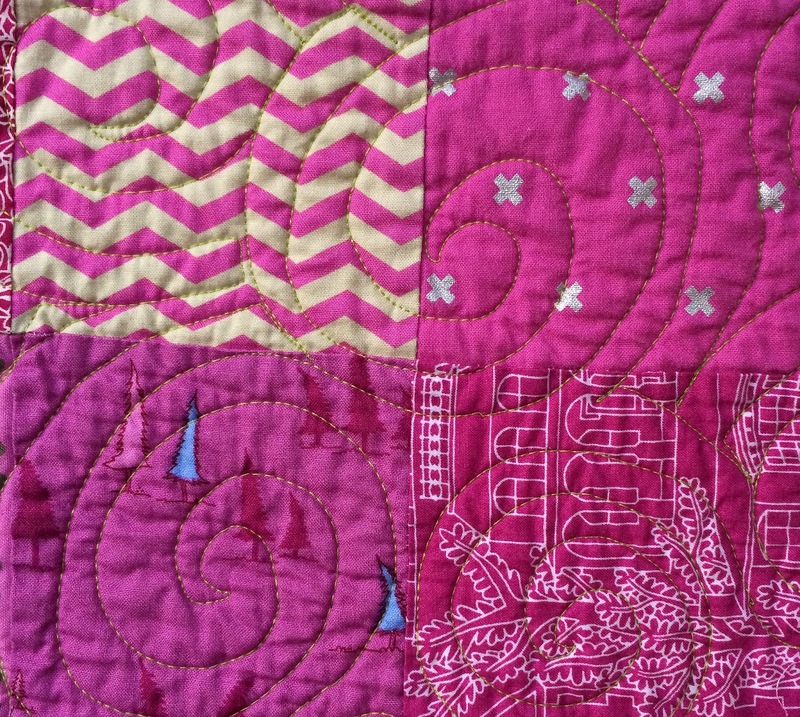 It's a combination of one of my favorite quilts from way back, and this tutorial I put up on my blog, called Complicated when Drunk, about doing piecing inside Drunkard's Path subunits. And actually, this quilt is kind of an accident. Or is it a design challenge? 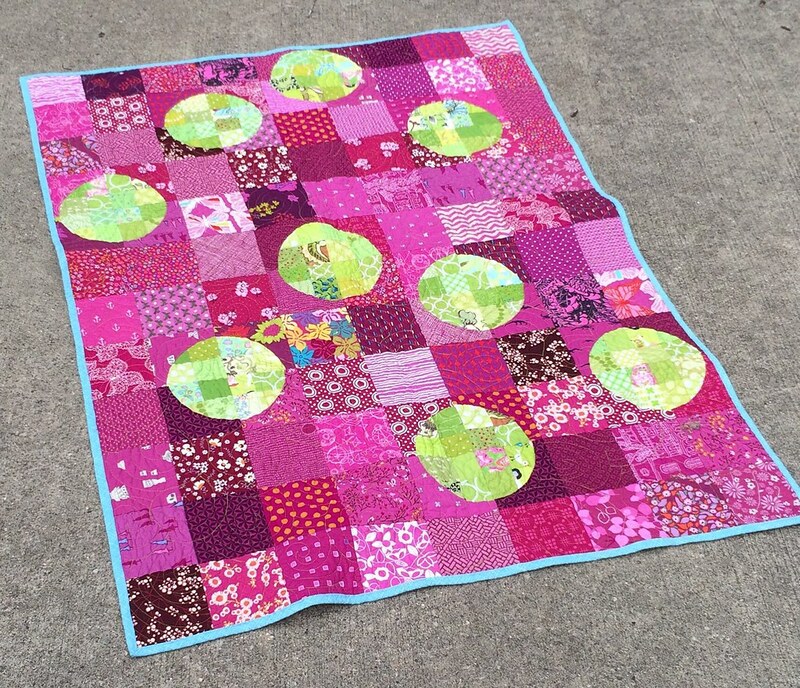 I had a lot of lime green 2.5" squares for a quilt which grew out of that tutorial; when I had that top pieced, I realized that I had cut many more lime green squares than I needed, so then, I ended up making two baby sized quilts in addition, just using up those lime green squares. I'm quilting the other one now. 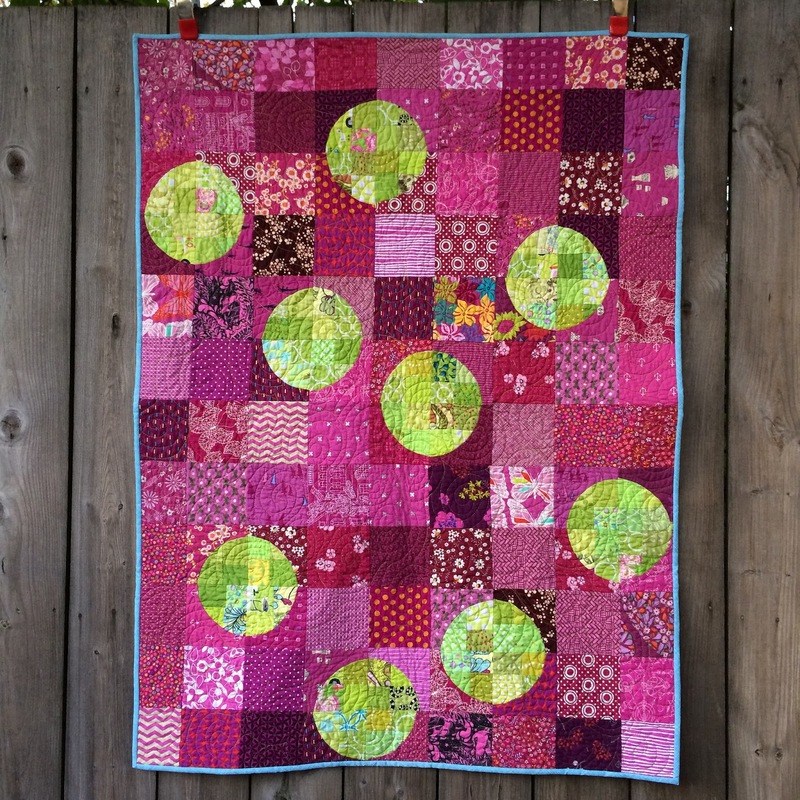 I'm not sure now how I hit on the red-violet and lime green combo, but I love it! It really seems to sparkle. And unlike the first quilt, there are no partial seams, so yay! 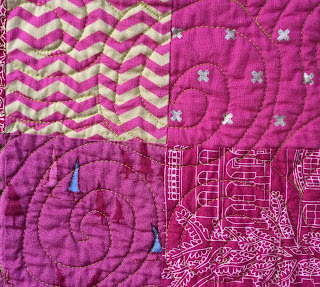 I used some nice lime green thread in large swirls to quilt it. The back is lime green, too. And the binding is a Carolyn Friedlander crosshatch. It's washed up and wonderfully soft. It's interesting to look at, but I'm not sure it has that super strong graphic statement. I'm not sure that this is the best placement for 9 circles in a background of a particular size. I like everything about this quilt, how the busy patterns fade out with the high contrast between the two colors, and I'd be pleased to see it at QuiltCon, but if it doesn't get in that's cool, it will be going to the local Children's Hospital, where it will hopefully find someone to love it. And if it does get it, when it comes home it will still go to the Children's Hospital just the same, because that's what I always meant for it. And I want to continue playing with the layout of this quilt. One day I will get it just right! I love the bold colors and the bold move to submit it. I also love that it will be given away regardless. Good luck with all your submissions! Great color combination. I think the graphic design is striking: the circles seem to hover above the magenta background.